Possum Rescue | New Sugar Glider Food Released ! New Sugar Glider Food Released ! Quick & Easy INSTANT-HPW. Finally available … an easy way to prepare and offer the popular HPW Sugar Glider Diet plan at a low cost. Your Sugar Glider will absolutely LOVE the pure vanilla bean flavor of INSTANT-HPW. Contains all of the ingredients in the original HPW Diet including Honey, Eggs, Wombaroo High Protein Supplement, Bee Pollen, Flax Seed Oil & Omega 6 & 3 Fatty Acids. Our professional staff formulated INSTANT-HPW to replicate the original HPW diet plan used by Sugar Glider owner’s worldwide. 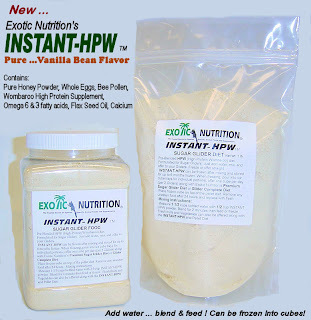 Exotic Nutrition’s INSTANT-HPW delivers an enriched diet plan that includes all of the ingredients found in the original HPW(High Protein Wombaroo diet), without the fuss, high cost of purchasing individual ingredients … or mess involved in it’s preparation! Simply add bottled water, blend, and it’s ready to feed, or freeze into ice cubes(Freezes soft)… to offer at a later time. Amazingly simple to prepare and flavored with pure vanilla bean powder that Sugar Gliders can’t resist! 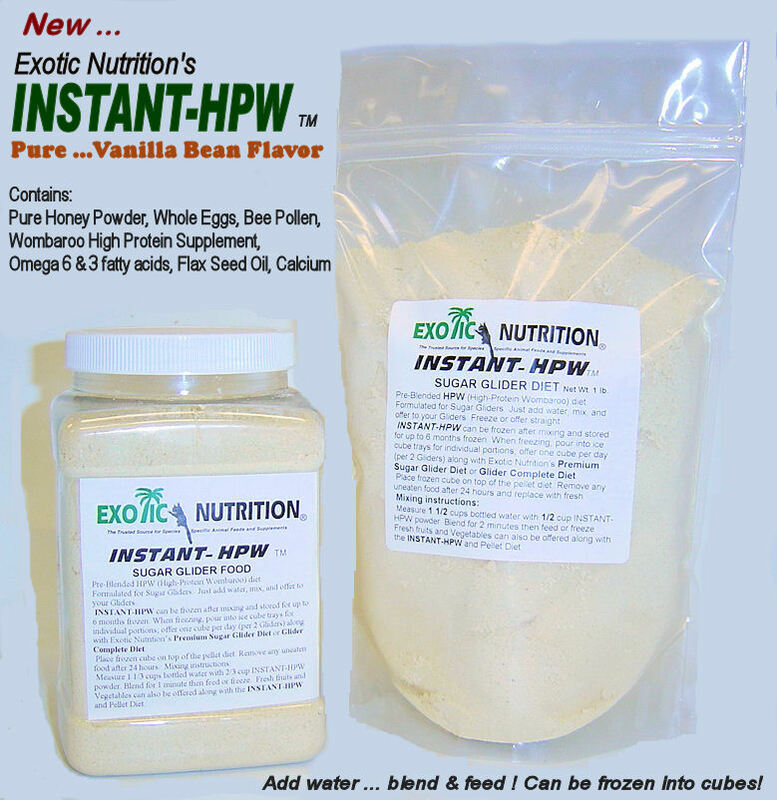 INSTANT-HPW can be frozen after mixing and stored for up to 6 months frozen. It will store in it’s original powder form at room temperature for up to 1 year. When freezing, pour into ice cube trays for individual portions; offer one cube per day (per 2 gliders) along with Exotic Nutrition’s Premium Sugar Glider Pellets or Glider Complete Diet. Place frozen cube on top of the pellet diet (2 tablespoons of either PREMIUM SUGAR GLIDER PELLETS or GLIDER COMPLETE DIET along with one cube of INSTANT-HPW for 2 Sugar Gliders, half that amount for 1 glider). Remove any uneaten food after 24 hours and replace with fresh. When mixed with water and not freezing, simply pour 2 Tablespoons of the liquid INSTANT-HPW over 1 Tablespoon of either Premium Sugar Glider Diet or Glider Complete (per Sugar Glider) and serve. After mixing with water, it can be stored refrigerated for up to 1 week, mix well before each feeding if storing this way. Packaged in resealable heavy-duty pouches. MIXING INSTRUCTIONS: Measure 1 cup bottled water with 1/2 cup INSTANT-HPW powder. Blend for 1 minute, then feed, store refrigerated or freeze into cubes. Fresh fruits and vegetables can also be offered along with the INSTANT-HPW and Pellet Diet. When feeding GLIDER COMPLETE … it is not necessary to add fruits & vegetables, since this food already contains dried fruits. Dried powdered honey, dried powdered whole eggs, whey protein concentrate, soy protein concentrate, ground cereals, powdered bee pollen, maltodextrin, dextrose, lysine, methionine, vegetable oils, flax seed oil, omega-3 and omega-6 fatty acids, vitamins A, B1, B2, B6, B12, C, D3, E, K, nicotinamide, pantothenic acid, biotin, folic acid, choline, inositol, calcium carbonate, dicalcium phosphate, phosphorus, potassium, sodium, magnesium, zinc, iron, manganese, copper, iodine, selenium, natural flavorings.